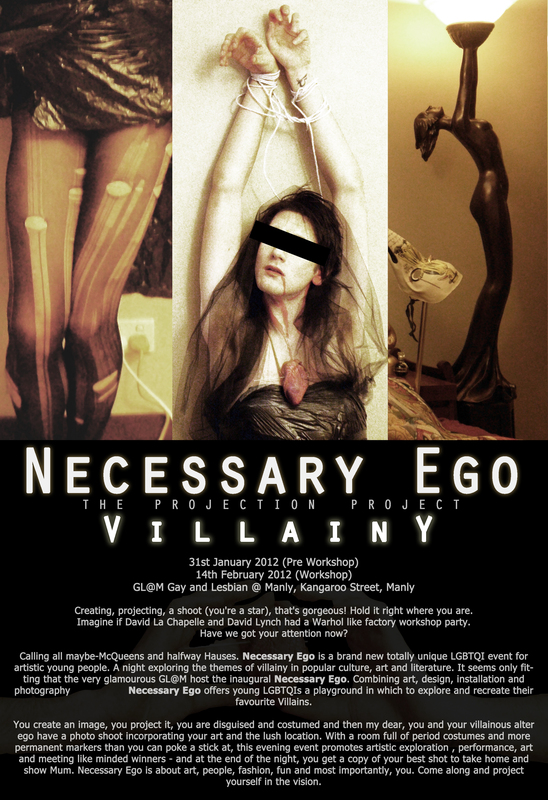 The pre-workshop for Sydney Gay & Lesbian Mardi Gras & Shopfront Contemporary Arts Centre‘s photo-shoot workshop ‘Necessary Ego’ starts tonight in Manly! Choose a villain, design a backdrop using projection and drawing, then transform yourself with our gaudy and fabulous costumes in order to be photographed and turned into a limited edition piece of art!! Check out the details on the poster for more info on how to book a place for the next workshop on Feb. 14th! IT’S FREE! This entry was posted in Shopfront Arts, Visual Art, Workshops and tagged Free Art Workshops in Sydney, GL@M Workshops, Mardi Gras, Mardi Gras Youth Festival, Necessary Ego, Projection Art, Sarah Emery, Shopfront Theatre for Young People, sydney, Sydney Gay and Lesbian Mardi Gras, tom christophersen, Villainy. Bookmark the permalink.